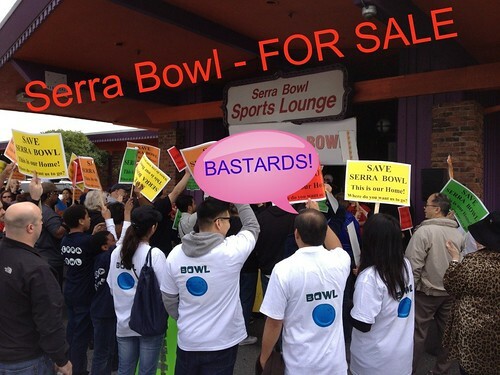 It’s pretty much the end of Serra Bowl. Instead of ripping out the lanes and moving to another location, or trying to fight back and get the lease renewed, they’ve pretty much made their choice. They put the last nail in the coffin and will be buried under cement. This Friday, April 27, the alley will be having an auction on everything, including the lanes and machinery. The preview will start at 9AM and the auction starts at 11AM. This is an opportunity if you want to buy some souvenirs, but it’s mostly the people who have a lot of money to buy the lanes and machinery to hopefully open a new bowling center or get some spare parts. So this is how the saga of Serra Bowl ends, in total disaster. I’m very disappointed.